It has been quite awhile since I've written about a children's book I love. It has probably been nearly as long since I've read a book to Annabelle that has had her giggling as much as this book did. 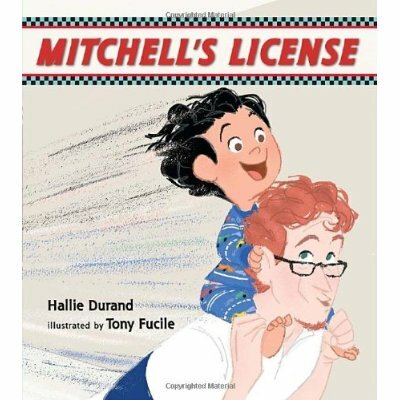 Mitchell's License by Hallie Durand is the story of a little boy, Mitchell, who doesn't want to go to bed. That is until he receives his "license" and a "car". He then drives his car to bed. 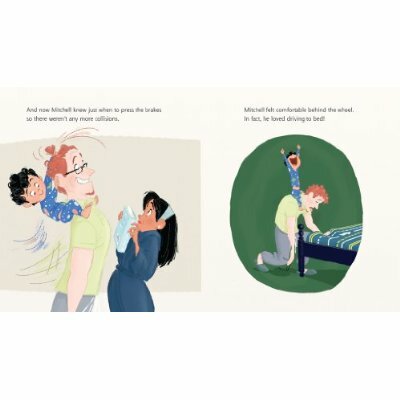 The text of the story describes Mitchell kicking his new cars tires, giving his car oil and avoiding crashes, the illustrations show Mitchell "driving" his father around narrowingly avoiding collisions with his mother and forcing his father to drink water from a sippy cup. Annabelle was in hysterics! It is immensely clever and one of a kind!